Win McNamee/Getty ImagesChristine Blasey Ford, center, is sworn in before testifying the Senate Judiciary Committee with her attorneys in the Dirksen Senate Office Building on Capitol Hill September 27, 2018 in Washington, DC. Attorneys for Christine Blasey Ford say their client is not interested in murmurings that Democrats may seek to impeach Judge Brett Kavanaugh if they reclaim the House of Representatives in the November midterm elections. Ford, the 51-year-old research psychologist and professor who accused Kavanaugh of sexually assaulting her when they were teenagers in the 1980s, believes she “did the right thing” in coming foward, according to her attorneys. Attorneys for Christine Blasey Ford, the 51-year-old research psychologist and professor who accused Judge Brett Kavanaugh of sexually assaulting her when they were teenagers in the 1980s, say their client is not interested in murmurings that Democrats may seek to impeach Kavanaugh if they reclaim the House of Representatives in the November midterm elections. Some Democratic lawmakers, who are poised to gain a number of congressional seats heading into the midterms, have floated the possibility of investigating Kavanaugh after he is confirmed to the Supreme Court. “We would have to investigate any credible allegations of perjury and other things that haven’t been properly looked into before,” Rep. Jerry Nadler of New York, the top Democrat on the House Judiciary Committee, said, referring to allegations that Kavanaugh committed perjury during his testimony. Ford agreed to testify in a high-profile hearing before the Senate Judiciary Committee on September 27. 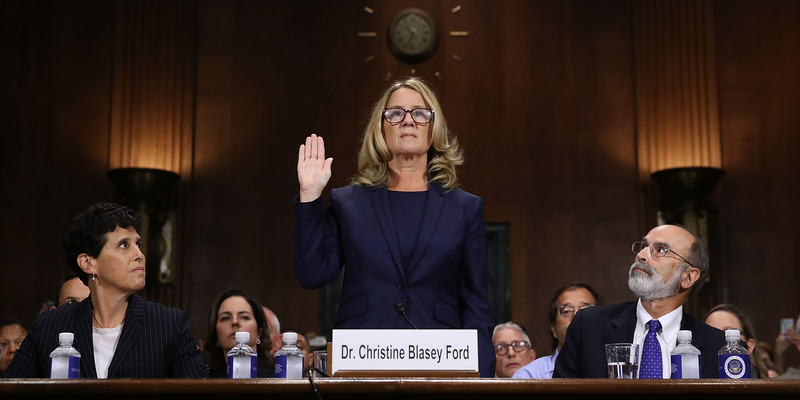 Ford said she was “terrified” by the process, but said she felt like it was her “civic duty” to come forward. Ford’s lawyers have prodded the FBI to interview their client for its supplemental background investigation on Kavanaugh. They said that despite conveying their willingness to discuss the allegation with law enforcement, they have heard nothing. The FBI submitted its report to lawmakers on Thursday, which paved the way for a procedural vote on Kavanaugh’s nomination to the Supreme Court the next day. Based on the initial votes, Kavanaugh is expected to be confirmed for the lifetime appointment after final votes are cast on Saturday.